Air (e.g. TB, chicken pox). Droplet, sneezing and coughing (e.g., mumps, rubella, common cold). Direct contact (e.g., salmonella from eating uncooked chicken, and sexually transmitted diseases such as syphilis). Indirect contact (e.g., salmonella from a sandwich made by the unwashed hands of a person infected with salmonella). 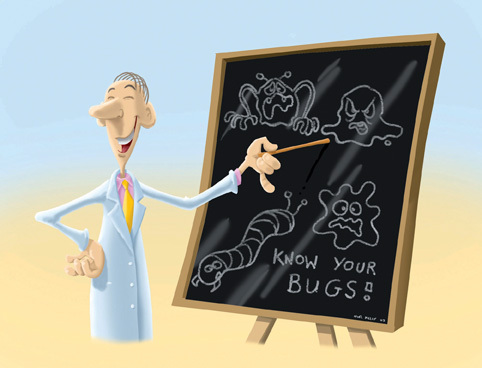 Vectors - e.g., mosquitoes spreading malaria. Eating a well balanced diet and taking regular exercise. Good general hygiene will help keep the skin in good condition. Regular hand washing, especially before eating, and after using the toilet. Attending for regular check-ups with your kidney specialist and GP will ensure that your kidney function and general health are maintained. Attending your GP or the kidney unit promptly if you are not feeling well. See chapter 4 for detailed information on infection associated with access. All patients are screened on admission and routinely for hepatitis B & C & HIV. All staff are vaccinated against hepatitis B. All patients are strongly recommended to bevaccinated against hepatitis B. Patients with known infections are treated insingle rooms, on special machines. See chapter 5 for detailed information on infection associated with Peritoneal Dialysis. See chapter 8 (Book 3) for information on infection, associated with transplantation. MRSA is the shortened term used when referring to Methicillin Resistant Staphylococcus Aureus. Staphylococcus aureus (S. aureus) is the name of the bacteria. The sensitive strain is found in the nose and skin of 20-30% of healthy people. The resistant strain (MRSA) means that it cannot be treated with antibiotics normally used to treat the sensitive strain. Some patients are colonised with MRSA and others have infections caused by MRSA. 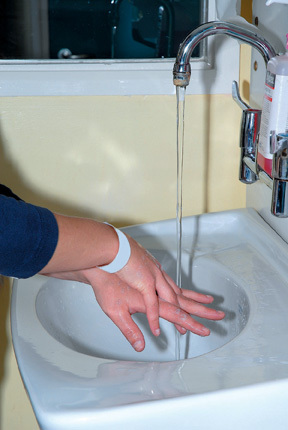 A patient is colonised with MRSA when he/she has no signs or symptoms of infection. It does not alter their treatment and is not a reason to stay in hospital. MRSA infection, like other infections, varies from mild to severe and depends on other factors, such as where the infection is, and the patient age and underlying conditions. A person found to be colonised or infected with MRSA will be nursed separately from other patients, in a single room (isolation), or in a room with others who also have MRSA (cohorted). This varies from patient to patient. The majority of patients are colonised, whilst some are infected. Colonised means that the VRE is not causing infection. The presence of VRE colonisation does not alter their treatment and is not a reason to stay in hospital. VRE infections can vary from mild to severe and depends on factors such as the site of the infection and the patient’s overall condition. Patients with VRE, in a wound or in a urine specimen or those having diarrhoea, need to be nursed in a single room (isolation) or nursed in a room with other patients with VRE (cohorted). C. Diff. is a bacteria that causes diarrhoea and may cause intestinal conditions such as colitis. It is a common injection in hospitals and long-term facilities. The use of antibiotics alters the normal bacterial content of the bowel and, thereby, increases the risk of developing C. Diff. diarrhoea. In most patients, the symptoms are mild and discontinuing treatment with antibiotics and fluid replacement results in rapid improvement. Sometimes, it is necessary to give a specific antibiotic, by mouth, for the condition. Unfortunately, 20-30% of patients relapse and need further courses of antibiotics. Patients need to be nursed in a single room (isolation) or, in a room with other patients with C. Diff (cohorted), until bowel movement has returned to normal. Varicella (chicken pox) - Vaccine for patients not immune and planning to receive a transplant. People should not get the vaccines if they ever had a life-threatening allergic reaction to yeast (Hepatitis B), eggs (flu) and/or to a previous dose (all vaccines). Pregnant women should discuss vaccination, with their doctor, and people who are ill should defer vaccination until feeling better. What Can Patients Do To Prevent The Spread Of Infections In Hospitals? Increasing space between beds and number of single rooms especially as new wards are built.